No matter how you slice it, humidity is the enemy. It creates the ideal environment for the growth of mold and mildew, is uncomfortable and is the prime contributor to bad hair days. And it’s lurking in your bathroom, basement, and even the laundry room. Now there’s an easy way to help reduce humidity without even the touch of a button! 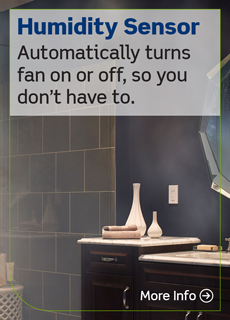 The Leviton Humidity Sensor and Fan Control automatically detects excess humidity in a room and activates the ventilation fan* to lessen condensation which helps reduce mold and mildew. As an added bonus, it also helps reduce energy usage by automatically operating the fan only when needed to control excess humidity. Gone are the days when the fan is left running indefinitely. One device, three applications. The Humidity Sensor and Fan Control offers three modes of operation for added convenience and each uses unique controls for the desired application. Automatic Humidity Control Mode – The sensor will automatically turn the fan ON upon detecting excess humidity. The sensor will continue to monitor the ambient air and automatically turn the fan OFF when the humidity level has dropped. The intelligence behind this is a semi-conductor humidity sensor within the device which actively senses/monitors the temperature and humidity level within the room the device is located. This information is fed into a microprocessor which in turn uses a Leviton algorithm to determine if there is an “event”. An “event” refers to a detectable rise or fall in the humidity level. Only an event will trigger the sensor to activate the ventilation fan when humidity rises and to deactivate the fan when the humidity level drops. It is important to note that in Automatic Mode, a humid day will not in itself qualify as an event. The rise in humidity must be significant such as when the shower is running. Manual Operation – For immediate ventilation needs, you can manually switch the fan ON or OFF by pressing the fan icon. Manual operation overrides automatic operation. For instance, if the user depresses the fan icon to initiate manual operation, the fan will stay on until it times out. The length of the timeout is set by the user by setting the timer adjustment to 10, 20, 30 or 45 minutes. The sensor, however, continues to monitor the humidity and if it detects that the humidity level has been reduced to an acceptable level it will prompt the LED light on the face of the device to blink. This is also true for the reverse – if the device is manually turned off but detects that it really should be on due to rising humidity, the LED light will blink to alert the user. Air Cycle Mode – The Air Cycle mode automatically turns ON a ventilation fan for a set period of time and repeats the cycle hourly. (e.g., 20 minutes ON / 40 minutes OFF each hour). This feature is great for areas in the home requiring periodic ventilation on a continuous basis such as basements, home spas or laundry rooms. The Air Cycle Mode is NOT triggered by humidity – it is intended to simply circulate air on a regular basis to help keep a room fresh from stagnant, stale air. Homeowners often use this functionality when they are away to keep air circulating within the home while windows are closed. To further customize your Humidity Sensor and Fan Control, user adjustable setting for Sensitivity, Time and Humidistat are easily accessible just underneath the face of the device. 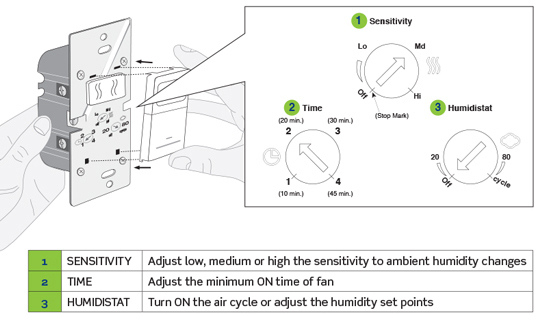 The Sensitivity setting indicates to the device how much of a change in humidity is necessary before it should react and activate the ventilation fan. The HIGHER the Sensitivity level is set, the quicker the fan will be activated. So, if the user finds just a slight increase in humidity uncomfortable the high setting is perfect. When set lower, the device is less sensitive to change in humidity and will wait to switch on the fan until the humidity level rises more significantly. In some homes, the Sensitivity dial needs to be set to a lower level if moisture from air conditioning or faucets located too close to the device trigger a false activation of the fan. 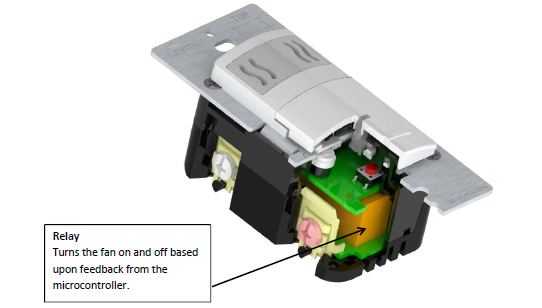 The Time setting regulates the minimum time the user wants the fan to stay on when activated. It is recommended that the Time be set to the lowest setting – 10 minutes. This generally provides ample time for humidity to be reduced and, if humidity levels have not dropped in that time in automatic mode, the sensor will continue to run the fan until it detects the level has dropped. If, however, the user sets the Time to the maximum of 45 minutes, the fan will remain activated for the entire time. Leviton caps the maximum fan ON time at 45 minutes to avoid the possibility of the fan running indefinitely. The Humidistat dial actually performs two functions – it acts as either a means to adjust the humidity set points or as the way to turn on the Air Cycle mode of operation. By setting the humidistat to a specific level, users are essentially setting their comfort level. So, if a user sets the humidistat to 40 and if the humidity level goes above this level, the fan will automatically switch on. Unlike Automatic Mode, once the humidistat is set any change in ambient humidity, even simply a humid day, will activate the fan. When set all the way to “Cycle” the dial activates the Air Cycle Mode. This operates on a one hour cycle and the fan will remain running based upon the time selected by the user (10, 20, 30 or 45 minutes). See Air Cycle Mode above. Leave doors and windows closed. Open doors and windows prevent the sensor from detecting subtle changes in humidity and will affect the operation of the Humidity Sensor. Ceiling heights in excess of eight feet may affect the sensors’ ability to properly detect shower/tub steam. And in large spaces, place the Humidity Sensor and Fan Control in close proximity to the steam/vapor source. Do not use the Humidity Sensor and Fan Control with a fan/light combination if that light is the only light source in the room because when the fan automatically turns off, so will the light. Changes in season may affect the operation of the sensor as ambient air quality changes. You may need to adjust the Sensitivity and the Humidistat dials accordingly. Fun Fact: If you breathe directly on the Humidity Sensor and Fan Control the moisture from your breath will activate the fan! 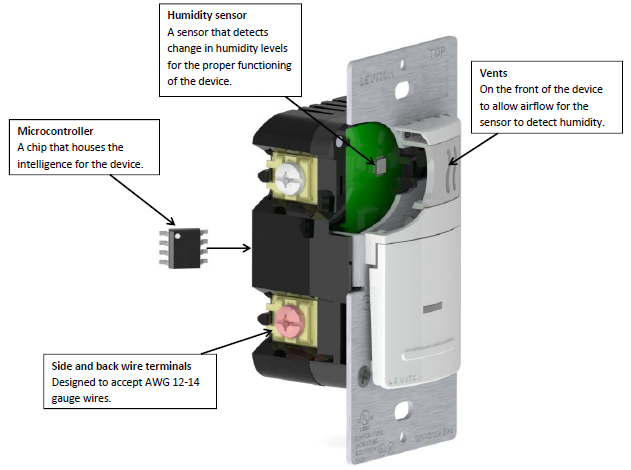 * The Leviton Humidity Sensor and Fan Control will not independently eliminate condensation. It must be used with a properly sized and rated ventilation fan in an enclosed space.